Sweet Amy, wife to talented Justin, was kind enough to meet me at the salon, with lunch in hand so we could hang out and chat sans kiddos. I must say Amy is one of the nicest people I know. Eating takeout together was a fun treat and I enjoyed the panini from Pizzeria 712 so very much. It's definitely the most delicious place to eat in Utah County (my sister-in-law Rachel swears by the butternut squash pizza btw). One last thing, Shep (top right), owner of Shep Studio, was the favorite stylist to many-a-roommate-of-mine in college. 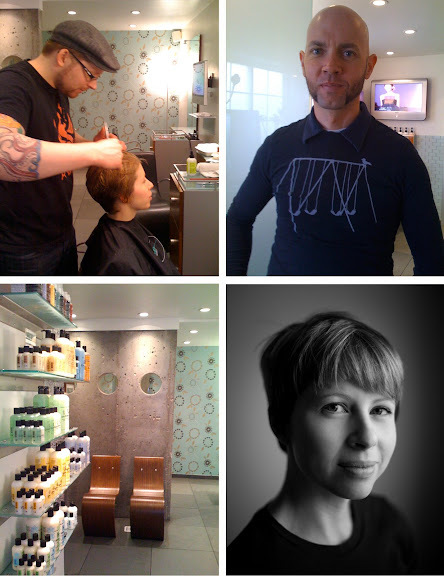 It's great to see him in his own salon now...over ten years later. Locals may be interested to know that the firm who designed his fantastic space also designed Lunatic Fringe salons too. Shep's studio was my home for all my years at BYU. I still haven't quite anyone to replace them since I have moved. What's a girl to do? your hair looks great. sorry that you had to survive a bad cut. I have friends who SWEAR by Shep. Cute hair, btw. I heart Patrick. He is magnificent. The end. That is so funny! Shep lived downstairs when we lived upstairs at our last place of residence! His Dad was our landlord and so wonderful! I'm glad Shep is doing well! That was hilarious to see him on your blog! Your hair looked great last time I saw you! I know what it feels like when I feel I had a bad haircut! Jon REALLY doens't like it when that happens to me. Tell Shep HI for us next time you're around. Steph- Patrick was my stylist for a couple of years too. Glad you were able to get a fix. I desperately need one now and am considering flying back to Utah just for that. Worth it? Not sure. Pizzeria 712 is definitely my fav down here. Next time you're in, see if they have their Panna cotta on the dessert menu. With yummy fresh berries... it's to die for. Even when we couldn't make an entire date out of an evening (i.e. kids in the backseat!) we'd stop off to grab some and take home! Also... you're hair looks great! Super sassy! What a fun afternoon! A hair fix, friend fix and food fix! Lucky girl...you look fab. You look lovely; you have the perfect, dainty features for short hair. I've never thought of having a friend meet me during my haircut to visit. Brilliant! Wow -- super cut. You look youthful but chic; independent but stylish. Glad you have the portrait so that you'll never be at a loss to explain this on. Bravo! I've been looking for a new stylist for some time, but disappointed to hear you drive all the way to provo....I've been driving to orem, but would love to find someone in SL county! My husband went to shep while we were dating and living in Provo...when he cared what his hair looked like, now he's switched over to great clips! very cute cut! I went to Summer when I lived in Provo for school at Shep Studio and LOVED her. The entire salon is so modern and I miss it (and I'm now in So Cal). I want to live in Provo! ;) I am in need of a hair cut too and yours looks absolutely awesome. i just clicked on your blog and saw my best friend on your sidebar for the justin hackworth pics! and shep's studio. love to see the friends i miss on your blog!